As everyone who’s ever looked at OCS knows, you need certificates to make it work. Although certificates aren’t really too difficult once you have the hang of it, they seem to be a tough hurdle for a lot of IT folks to get over. I’m not going to attempt to explain PKI today, but I thought I might share a story about a gotcha that got me, twice. Hopefully my pain (although it was only a few minutes of troubleshooting this time) will help someone else. An HTTP application request sent to an Mcu or Service timed-out. Requests will be retried but if this error continues to occur functionality will be affected. Cause: Network issues, non-provisioned MCU or non-functional MCU. Ensure that the Service is provisioned and functioning correctly. If any network related errors are reported by the Service ensure that they are resolved. The process ASMCUSvc(7596) failed to send health notifications to the MCU factory at https://ocsfe.us.domain.net:444/LiveServer/MCUFactory/. Failure occurrences: 1021, since 1/13/2010 11:20:11 AM. Important to mention at this point is the certificate I was using for my pool was provided by a third party (Godaddy in this case). At this point I opened up MMC and added the certificates snap-in for the computer account. I checked my certificate and it looked just fine, as did the intermediate certificate. 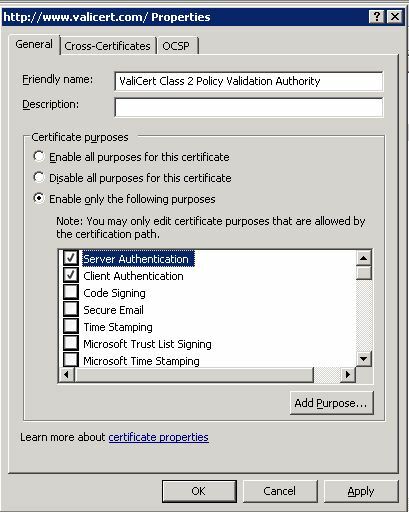 However the trusted root cert for “Valicert” only had 2 purposes enabled (right click the certificate and choose “Properties” to see this). But it wasn’t very obvious to find so I figured I’d post here just in case someone else runs into the same issue. Hope this helps someone out there! This entry was posted in Uncategorized and tagged 32052, 32052 warning, 61013, 61013 warning, A/V Authentication, Live Meeting, Live Meeting Prompts for authentication, OCS, OCS 2007 R2, OCS 32052 warning, OCS 61013 warning. Bookmark the permalink. 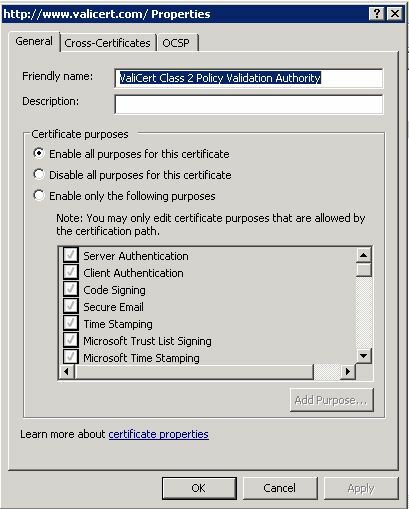 yes, this works for me too, but the certs always revert back to “Enable only the following purposes” within a couple of days. Is there a way to make this stick permenantly? I’m not sure what would cause this for you, maybe a windows update or group policy? Unbelivable: Thats it!!! Thanks for this Post!